Welcome to the Codrington Wind Farm Tours. A leisurely twenty-minute journey from Port Fairy west along the Princes Highway will bring you to the roadside car-park and the Wind Farm. It is an understatement to say that the towers are impossible to miss! This was the first wind farm in Victoria, and at the time of construction, the largest wind farm in Australia, and is located in a magnificent setting. The 34 towers include 14 towers of the Codrington Wind Farm (2001) and 20 towers of the Yambuk Wind Farm (2005), and can be viewed easily from the car-park and viewing platform. However, for a really impressive close-up look at the 70m towers and their rotors, you will be greatly rewarded by taking a tour. Tours also enable views of the farmland (and eye-to-eye contact with sheep and cattle as they wander across the tracks), and surrounding countryside. Magnificent isolated beaches can be seen, as well as a nearby island, and further away, Portland Bay and old volcanos. Educational tours are available to the general public, schools and coach tours by pre-booking on 0419 188715. Tours last approximately one hour and take visitors across the farm to the base of a wind tower, where visitors can walk around, take photos, ask questions, etc. On the way, a professional commentary provides information about the history of the farm (which has been in the same family since 1856), and the development of wind power, as well as technical information about the turbines. Inquiries regarding hours and availability to the Port Fairy Visitor Information Centre or 0419 188715. Codrington Wind Farm Tours has been in business since July 2001. Since that time, we have provided tours and answered questions for thousands of visitors, young and old, with varying levels of interest in alternative sources of energy. We have catered for students from Preps to university level, as well as family groups and hundreds of general interest coach groups. 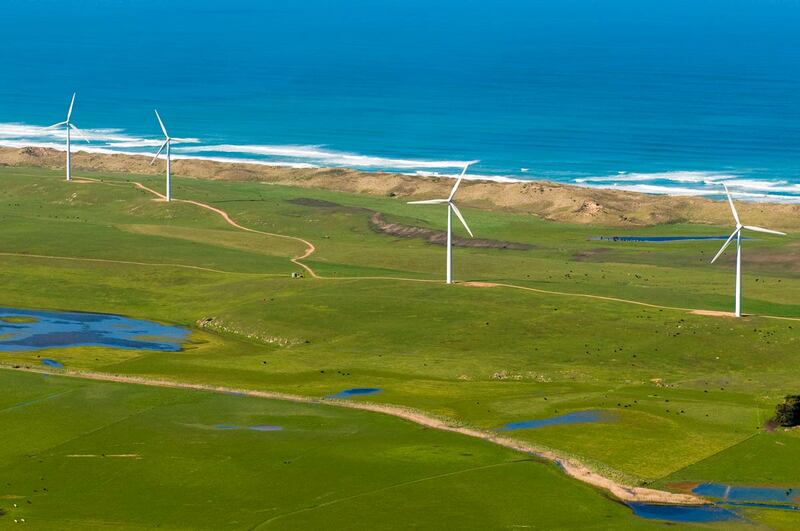 The Codrington Wind Farm Tour guide can join coach tours in Port Fairy by arrangement, and provide an informative narration on the drive to Codrington. In that relatively short 20 minute-drive, we pass diverse farming enterprises (dairy, sheep, beef, buffalo, aquaculture, agroforestry, quarries, tourist enterprises, and of course wind farming). Prices on application - Phone 0419 188715.